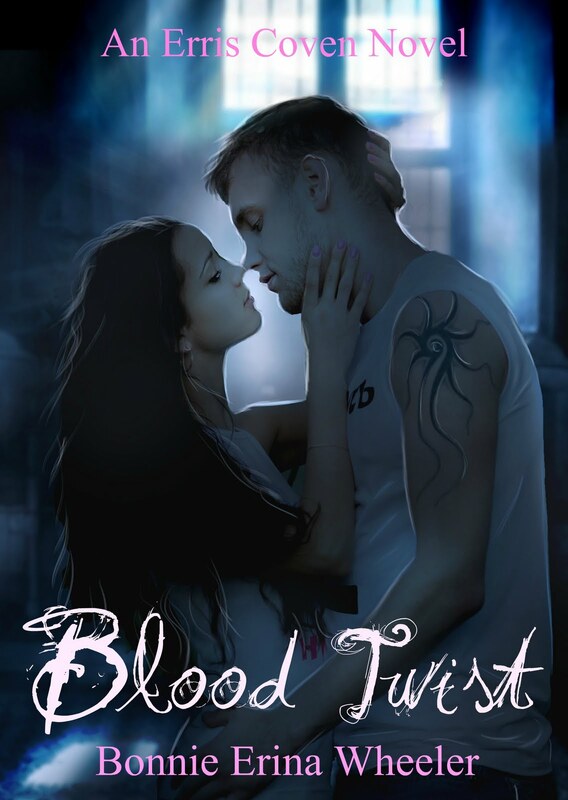 Goodreads: From Bonnie Erina Wheeler, the author who brought you Fate Fixed, comes the second installment in the Erris Coven Series, Blood Twist. Find out what happens to the Erris Coven when Lexie's BFF Liz comes to town. Braden Murphy knew he was going to die. There was a twist to his family secret – one that was forced upon him from the time he was a child. For years he envisioned his final days and tried to be strong enough to leave his family. Now that it was time, he was ready to make good on a deadly promise. Except for one unexpected glitch, a raven haired beauty insisted on joining him. Braden is tempting, but Liz’s feelings for him are complicated. She wishes he would open up about his past and give her a reason to trust him.Just when Liz thinks she can let her guard down, she’s forced to confront the evil that has been stalking Braden’s past for years. Death is here and ready to destroy everything they've fought to save. When Liz comes to visit her best friend lexie and save her from her overbearing step family she has images of fun times and bitching sessions, but what she finds is far from what she expected. lying on the basement floor is an injured lexie her injured mother and two dead werewolves! not to mention her best friend is fated with a half vampire! to make liz more confused she is having feelings for a half vampire Braden. When she offers to go away to find the cure for ruby Lexie's mam Liz is insistent on going with him, reluctantly and with pressure from his cousins he agrees, but with a plan to send her straight back home before he meets his fate. unfortunately everything doesn't go to plan. Liz and Braden get caught in the middle of a vampire nest that not only brings them closer together also threatens to tear them apart. desperate to get Liz out of trouble and away from the vampires that want her dead Braden makes a plan, but with truths about his fathers death and brother disappearance coming out who can he trust? can he get them both out alive? and at what cost? I enjoyed the first book in the series so when i found the second one i had to read it. it was even better than the first one. from the first page i was gripped and could not stop reading! all the characters i loved from the first book when in this book plus more. I was happy that you got to see that Lexie has a happy ending with fate partner Torin. I loved how the first book was werewolves and the second was mostly vampires. I enjoyed the plot and story-line i loved how Bradens past slowly unraveled as the book went on, all the time you had to guess on what little information you were given and try and drew a conclusion then you were given a little more information, all the way through you are hanging on the end of your seat not knowing who to trust or whats going to happen. I thought the book was amazing it was full of suspense, action,romance and surprise! everything you need in a good book! I loved all the characters from the first book and i loved Liz and Braden. I thought Liz was a strong and brave lead female , not one those damsel in distress leads, she was funny and witty all the way through and i loved how she always wanted to be in on the action. Braden was another amazing lead character, he was charming, shy, determined and passionate all in one! This was am awesome book and i cant wait to read the next one!